A superhero as iconic as Spider-Man is sure to attract quite a few villains to his web. From wicked symbiotes like Venom and Carnage to nefarious archenemies like Doctor Octopus, the Green Goblin, and more, Spider-Man has had a variety of enemies throughout his many iterations, and they have appeared to oppose him again and again in comics, animated series, movies, and more. 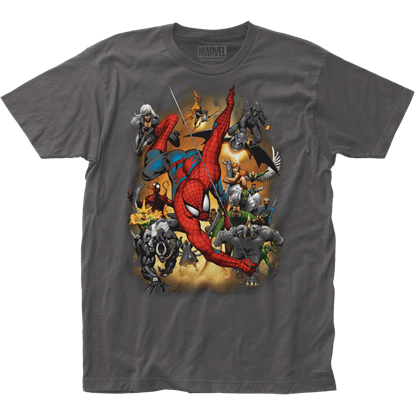 At Superheroes Direct, shop for products and apparel featuring this diverse gallery of rogues. Dress up as your favorite supervillain with our many costumes and masks for adults and children. Decorate your home in sinister style with items like our Venom Door Topper, or add just a touch of villainy with licensed figures and statues. Show your love for these fiendish foes with t-shirts, wallets, hoodies, and other clothing and accessories, all featuring graphics and designs that displaying the might of Spider-Mans various villains. 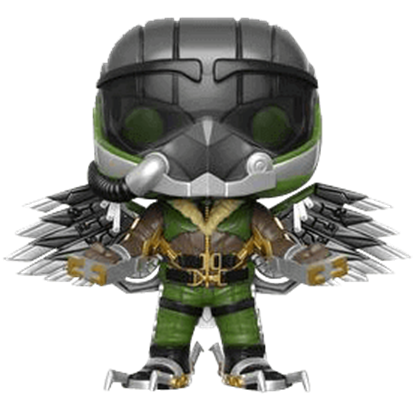 Displaying the mechanical flying suit and helmet worn by the genius inventor Adrian Toomes in the 2017 feature film Spider-Man Homecoming, this Marvel Vulture POP Figure is a stupendous addition to any supervillain collection.